Explanation: As expected, the ozone hole near Earth's South Pole is back again this year. This time, however, it's smaller than the past two years, and has an unusual double lobe structure. Ozone is important because it shields us from damaging ultraviolet sunlight. Ozone is vulnerable, though, to CFCs and halons being released into the atmosphere. International efforts to reduce the use of these damaging chemicals appear to be having a positive effect on their atmospheric abundance. The smaller size of the ozone hole this year, however, is attributed mostly to warmer than normal air in the surrounding stratosphere. 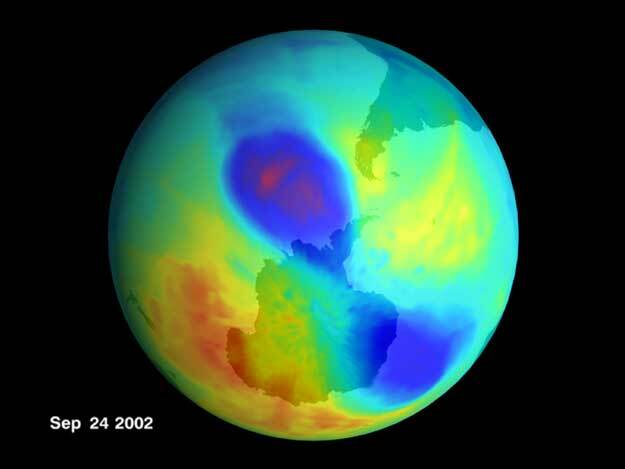 The above picture of the ozone hole was taken on September 24 by TOMS on board the orbiting Earth Probe satellite.